It seems that the season-changing fox-based platformer genre is starting to get a bit crowded, what with this and the long-in-development Seasons After Fall. 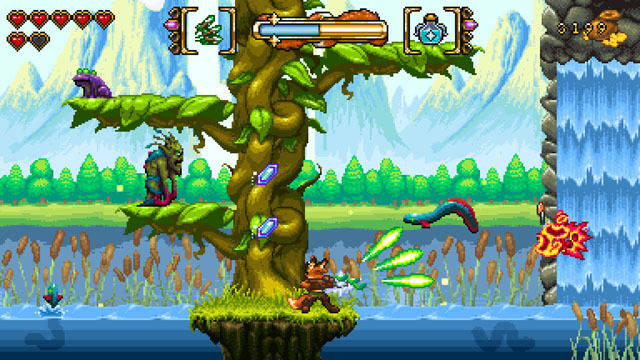 Developer Bonus Level Entertainment (game tweets) presents Fox n Forests, a game inspired by the colorful platformers of the 16-bit era. You play the role of a fox as he travels through environments themed on each of the four seasons, on a quest to prevent the coming of a devastating fifth season. Along the way, the fox can alter the seasons, allowing winter to give spring and summer a miss and go straight on into autumn, and changing the world around him. For instance, the impassable waterways of summer may be safely passed by changing the season to winter and freezing them over. The fox uses a short-range sword and various projectile attacks to take down pixellated foes as he hops across platforms, slides down ziplines, collects coins, and faces off against the occasional screen-filling boss. The game is now available for PC, Mac, and Linux via Steam, Switch via eShop, and PS4 via PSN, and an Xbox One version is arriving soon via Microsoft Store. Check our coverage here.